It's hard to put a finger on what makes the place buzz so hard, but the city's hyperactive rush keeps drawing more and more people to it. New York is a densely packed mass of humanity and all this living on top of one another makes the New Yorker a special kind of person. They don't come any bigger than the Big Apple, king of the hill, top of the heap, New York, New York. It's got its fair share of the tired, the poor, and the huddled masses, but it also has big statues, world-class museums, even bigger buildings, outrageous excess. This city is so much a part of the global subconscious, it's pretty hard to pick a few highlights - wherever you go you'll feel like you've been there before. The Museum of Modern Art is one of the world's top museums, and the Guggenheim Museum and American Museum of Natural History aren't far behind. Bookshops, food, theatre, shopping, people: it doesn't really matter what you do or where you go in New York because the city itself is an in-your-face, exhilarating experience. 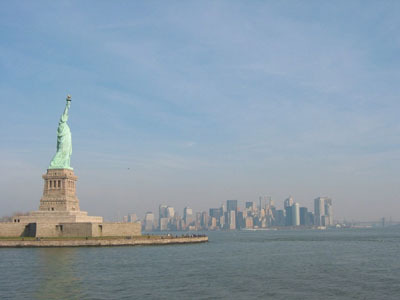 For iconic value, you can't surpass the Statue of Liberty, the Empire State Building, Central Park and Times Square. Security after the September 11 terrorist attacks remains high. Most visitors will not be seriously inconvenienced by the new precautions. In airports where added checks can cause delays. Telephone Area Code: Manhattan 212 or 646. 718 Brooklyn, the Bronx, Queens, and Staten Island. The region had been occupied by Native Americans for more than 11,000 years before Giovanni da Verrazano, a Florentine hired by the French to explore the northeastern coast, arrived at New York Bay in 1524. 'It is as beautiful a land as one can hope to tread upon,' reported Hudson, who claimed the place for the Dutch East India Company. The area lay unmolested until English explorer Henry Hudson stumbled on it while searching for the Northwest Passage in 1609. In 1625, the Dutch settlers had established a fur trade with the natives and were augmented by a group that established a post they eventually called New Amsterdam, the seat of a much larger colony called New Netherland. Advertisements in Europe lured settlers to New Amsterdam with promises of a temperate climate and bountiful land, but the harsh winters claimed many lives. Historians agree that Peter Minuit, the director of the Dutch West India Company, purchased the island from local tribes for goods worth a pittance, but the goods were worth a bit more than the 24.00 commonly recorded probably closer to 600.00 (still a bargain). New Amsterdam became the British colony of New York in the 1670s. Though colonists began cultivating farms in New Jersey and on Long Island, the port town remained geographically tiny - the area that today runs from Wall St south to the tip of Manhattan. Anti-British zeal caught on as early as the 1730s. Despite the intensity of New Yorkers' sentiments, King George III's troops controlled New York for most of the war, finally withdrawing in 1783, a full two years after the fighting stopped. In 1760, New York's Commons - where City Hall stands today - was the centre of many anti-British protests. New York population swelled from 65,000 in 1800 to 250,000 in 1820. Population boomed in the early 19th century. During the Civil War, the city provided many volunteers for the Union cause. But as the war dragged on, many of the city's poorest citizens turned against the effort, especially after mandatory conscription was introduced. In the summer of 1863, Irish immigrants launched the 'draft riots' protesting the provision that allowed wealthy men to pay 300.00 in order to avoid fighting. More than 11 men were lynched in the streets and a black orphans' home was burned to the ground. Within days the rioters turned their anger on black citizens, as they were considered the real reason for the war and their main competition for work. The important fact of the 19th century in New York was a boom time for the city's population, which grew thanks to European immigration, and for businessmen, who took advantage of lax oversight of industry and stock trading during the so-called 'Gilded Age'. Along Broadway from City Hall to Union Square, multi-storey buildings - the first 'skyscrapers' - were built to house corporate headquarters.These men built grand mansions along 'millionaires row' on lower Fifth Ave. The burgeoning of New York's population beyond the city limits led to the consolidation movement, as the city and its neighbouring districts struggled to service the growing numbers. As the city's population more than doubled from 500,000 in 1850 to over 1.1 million in 1880, a tenement culture developed. Residents of the independent districts of Queens, Staten Island, the Bronx and financially-strapped Brooklyn voted to become in 1898 'boroughs' of New York City. Since 1900 to 1930 the new metropolis absorbed a huge wave of European immigrants who arrived at New York's Ellis Island and its population exploded, from just over 3 million in 1900 to 7 million in 1930. As the immigrant population gathered political strength, demands for change became overwhelming and during the Depression a crusader named Fiorello La Guardia (previously an Ellis Island interpreter) was elected mayor. During this period, horse-drawn trolleys disappeared as a major network of underground subways and elevated trains ('Els') expanded into the city's outer reaches. In three terms in office the popular 'Little Flower' fought municipal corruption and expanded the social service network. Unfortunately, his projects (which include the Triborough Bridge, Lincoln Center, several highways and massive housing projects) often destroyed entire neighbourhoods and rousted huge numbers of residents. Meanwhile civic planner Robert Moses used a series of appointed positions to remake the city's landscape through public works projects, highways and big events like the World's Fairs of 1939 and 1964. As one of the few world-class cities untouched by war, New York seemed the place to be. New York emerged from WWII proud and ready for business. But prosperity wasn't limited to the city. 1950: highways made access to the suburbs easy and hundreds of thousands of New Yorkers moved away permanently. It wasn't just an understandable desire for upward mobility that drew them away: many white residents left neighbourhoods they felt had 'gone bad', which was a racist way of saying that African Americans and Puerto Ricans had taken their rightful place there too. While the politicos dithered and played to various entrenched constituencies, the city began to slide. Like most of the US, New York looked to the West for cultural direction, and eventually corporations began abandoning the city as innovation in communications technology made it possible to do business anywhere. TV production, manufacturing jobs and even the fabled Brooklyn Dodgers baseball team moved to the West Coast, along with the Dodgers' cross-town rivals the New York Giants. The city's economic slide led to the threat of bankruptcy in the 1970s, which was staved off only by massive infusions of federal cash. During the Reagan years, the city regained much of its swagger as billions were made on Wall St. Ed Koch, the colourful three-term mayor, seemed to embody the New Yorker's ability to charm and irritate at the same time. But in 1989 Koch was defeated in a Democratic primary election by David Dinkins, who became the city's first African American mayor. Dinkins, a career Democratic-machine politician, was rightly criticised for merely presiding over a city government in need of reform, though his moves to put more police on the streets helped curb crime. He was narrowly defeated for a second term in 1993 by moderate Republican Rudolph Giuliani. Thanks to a big drop in crime and the weakness of his Democratic opponents, Giuliani triumphed in the 1997 mayoral election. Times Square underwent transformation from a crime- and drug-ridden red-light district in the 1960s and 1970s to a Disneyfied tourist attraction in the late 1990s. For the first time in decades the city contemplated huge projects to augment its infrastructure, such as a new rail tunnel under the Hudson River. The city became safer and more prosperous, but also more homogenised; the gap between rich and poor widened, and the colourful subcultures that used to give Manhattan its edge began a mass exodus to the suburbs. New York's famous hustle and bustle was abruptly cut short on 11 September 2001 when a attack in the form of two hijacked passenger aircraft razed the gleaming twin towers of the World Trade Center. Thousands of people were killed in the worst terrorist act ever on US soil. New York, though severely shaken, showed its grit. Shops and restaurants near the site re-opened, tourists re-appeared and the rebuilding for the Ground Zero site's rebirth is underway. The city was quick to regain its composure and normality, rebuilding its business district and its confidence.